In this second Listener Comments episode, we hear more from you. SuperFastBusiness fans can leave their feedback, questions, and I answer them. 02:25 – What are the best platforms for membership sites? 18:29 – Providing business services – how does it work? James Schramko here, welcome to Episode 2 of the listener comments. This is where you get to be on the show, and you do that by putting a voice message. At the bottom of the site there is the option to leave a voice message. So this is what we caught in the last week or two, and as the site powers on to over 72,000 page views a month, 60,000 downloads, and 36,235 visitors, it’s turned into something quite special. In this episode, you’re going to find out about becoming a business service provider. You’ll also hear about how to set up a recurring membership or recurring subscription program, and a whole bunch of other stuff. So let’s listen in to our listeners. Listener: Well thank you James and Manu for the poses, what a fantastic idea. I especially like your outdoor office with the greenery and the birds chirping in the background. James: Thank you, Douglas. The Yoga Minute is a lot of fun, actually. I didn’t know if people would like that or not, but it appears that a lot of people can relate to being sitting behind a desk for too long. Certainly having a stand-up desk has been a big improvement for me, and yes I do like all the birds and the greenery and being able to film around different parts of the house. And I’m thankful that I’m not driving to work in a car, sitting in traffic, and having to wear a suit and tie every day. So that’s one of the best things about growing a very profitable Internet business, is that you do have that freedom of lifestyle. Now Yoga Manu Minute will continue, as long as we get good feedback. Manu comes down to my house once every week or so. He sits in on some of the mastermind calls that I run and I always encourage him to hop out there and give me a new yoga lesson. He doesn’t have preparation time, he does it on the spot, and if you have any specific yoga requests, then hit that voice widget and leave me a voice message. Tell me what you’d like Manu to teach you for your yoga moves. Listener: Good day, James, excuse the fish tank sound in the background, there. Thanks for the interview with Chris Farrell about the continuity program. Can you tell us some of the best platforms to use to create a membership site on, such as Ning versus other membership sites that are created on WordPress? I’d really like to hear about that more and I’m sure there would be others, too. Thanks a lot, mate. Marty, bye. James: Hey, Marty, I really hope that was a fish tank and not you just recording in the bathroom. All right, so you asked a great question. The episode with Chris Farrell was super popular, and that’s because a recurring income is super desirable. Now one thing is, just keep in mind, you don’t actually have to have a forum aspect to a continuity program, even though I do. My preferred platform is actually vBulletin. I’ve used a few different platforms. I find the WordPress forum platforms are a little bit clunky, I find that Ning is very slow-loading and quite disorganized. But the most important thing is, I like to control the asset. I want it on a domain that I own, I want it to be easy to use, and I like vBulletin because I can embed videos, I can control the entrance via the cart that I use, which is Nanacast, so I can turn people on or off. And I can use special things like coupons and I can keep tabs on reporting. Now a subscription model doesn’t need to have a forum aspect. If you’re going to set up a forum, you really want to make sure you have enough people to make it worthwhile, because it is literally like having a child. It’ll be something you maintain every single day, and unless you make it valuable enough to warrant that attention, it’s not going to be a good move for you. So what are subscription things you can have without a forum? You could have a video of the month, or a premium audio content. I mean, we’re used to subscribing to things like magazines and newspapers, telephone services, all these recurring programs that are not forum based, so keep open to the possibilities there. Even if you take it to the simple things like vitamins that people will get shipped every single month, that’s a physical product but it’s on a recurring subscription. So the main point of the interview is to look for ways that you can set up your products to be delivered, or your services to be delivered on a continual basis, where people just sign up once and then they keep ordering. Now if you are hell-bent on making a WordPress membership, there’s a few ways to go about that. One is to use WishList, another is to use DAP, D-A-P, and another is to use either a Nanacast member lockdown, or an Office Auto Pilot WordPress integration. So I’ve seen all of these things work pretty well, and they can look nice and clean and simple, but they’re not going to be as effective, if you want a forum aspect, as something like vBulletin. If you’re just doing simple memberships without any commenting, then consider something like Nanacast where you don’t actually need to use WordPress at all. You can just have your membership, put videos in there using an embedded player (I like Wistia) and then you can just deliver the membership. So most of my front-end products were delivered in this fashion, and the same with the ones that are available from BuyWithBonus. They’re single memberships, they’re very effective, low-maintenance, easy to use, and the more memberships that people buy from you, the more they can actually see or access from the one login, so that’s quite sensible. If you haven’t listened to this episode, by James and Chris Farrell, go on, check it out. Listener: Hi James, it’s Paul here, I just wanted to say thank you so much for the amazing content you provide. I’m so glad that I found yourself and your services, and all the information you’ve been providing in your podcasts and websites. Yeah, just keep up the great work, mate, we really appreciate it. I certainly appreciate it, and my two best mates are onto your stuff now. I just want to ask a question about business service provider. I’m looking to provide your products. I just wanted to see if you’ve got any case studies or other websites, other people who are doing it really well out there in the marketplace, just for inspiration. Whether it’s a private access or maybe something that you can share with all of your listeners, I’d just like to get some information around that, how people are going about providing business services, what they’re doing to create their success. So I’m going to finish up, have a crying baby in the background here, so thanks for your time, mate, and again keep up the great work, really love your stuff, so good on you, have a good one mate, take care, bye. James: Hey Paul, thanks for calling in, and also a special guest appearance, probably one of our youngest listeners. I would say with regards to the service provider thing, a lot of them are quite private and the real advantage of being a provider over an affiliate is they get to set up their own brand and their own entity. The best place to find business service providers is inside SuperFastBusiness, because a lot of the people providing SuperFastBusiness Traffic Services and website services are in there, and getting good ideas and templates, etc. The absolute best place is to come along to FastWebFormula 4 Live, because they will be there. Some of them are doing mid to late six figures. Now I’ve just sent off a little note to ask one of my service providers if he’d be interested in going public about his model, but I do that out of respect because again, the point is a provider is building their asset and their IP. And as I’ve learned in this industry, if you start to reveal too much stuff then the next thing you know there’s a bunch of copycats out there. They literally cut and paste. So for that reason, we’ve set up a service provider template on ATLWeb. It’s In the Responsive Theme section down at the bottom of the page. That provider template is a really good starting point for a website that more or less mirrors the services that we offer, but it allows you to build your own brand, your own asset that you could sell, and of course you can use any supplier that you want, it’s just my job to make sure that our supply is the best available. So hopefully that gives you some pointers to get started, and I look forward to seeing you at FastWebFormula. Listener: Hi, my name is Mike, and I’m just leaving you this message because I was all set to purchase Traffic Grab at long last, and I see that it’s now only available as part of the SuperFastBusiness. I’d like to be part of it just for the community and everything else and have access to you. So anyway that’s my message, thanks for listening to this, and yeah, I guess that’s it and I guess I’ll just keep at it. Thanks James, bye. James: Hey, Mike. Yeah, that’s something that I did early this year is I made the individual products that I have like Traffic Grab all part of SuperFastBusiness. I was getting feedback that I had a lot of stuff, and people were continually asking “What are all your products?”, and I said the easiest thing is I just put them into SuperFastBusiness. 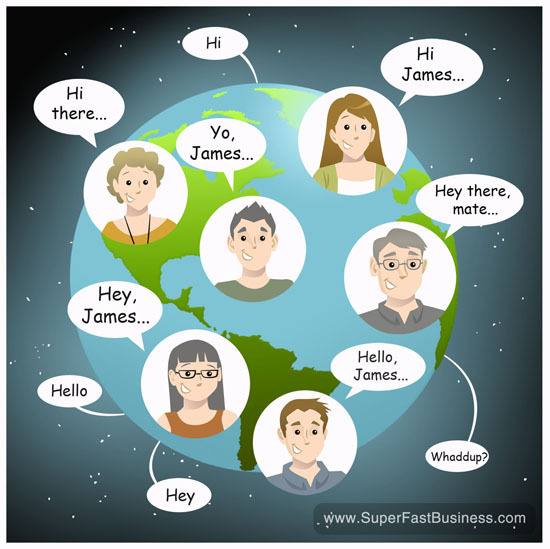 When you become a member of SuperFastBusiness, I’m in there answering questions everyday, but all of my courses are now in there, including the SuperFastPPC, SuperFastAffiliate, the Traffic Grab 1 and 2, the recordings from FastWebFormula 1, 2 and 3 live events, there’s also Underground Profit System, and a bunch of other ones like ThinkWayBigger, Affiliate Pounce, SuperFastConversions. I mean there’s so many products in there, and recently I added Wealthification as well as a little thank you for the members, because as you know I’ve put the Own The Racecourse course out on SuperFastBusiness for free. On the sidebar there’s a banner, and it talks about getting more traffic and increasing your conversions. That is the Own The Racecourse course. So if you’re listening to this from SuperFastBusiness, you can actually opt in and get links to all of the modules that are on SuperFastBusiness and enjoy that course absolutely free. Hopefully that’s a good enough indicator for you of what’s inside SuperFastBusiness where we have now got six hundred and something members as of time of recording and it’s a wonderful, thriving community. And of course we’re very excited about our live event coming up in June in Sydney. Hope to see you there. Listener: Hi James, my name’s Tony and I’m looking to see if you can answer a question for me, it’s really about a new website that we’re looking to launch, and so we’re starting off from scratch, so we’re looking for the best way to do that. It’s going to be a site that will sell nutritional supplements, but initially it will just be maybe one product, one or two products, so it’s not going to be like a whole page of different products. We need to think about how that would appear on the display. But also, I’m just keen that we start off in a way which means we can grow as the months and years go by that we don’t get railroaded down a route of something that we need to change, a site that we need to change after a few months as the revenue starts coming in or we need to put more products onto it. So I just wonder what your thoughts were on that. Ok thanks, Tony. James: Tony, okay, for your challenge I would suggest a WordPress website, and that will allow you the flexibility to have pretty much anything adjusted as you grow the business. We use Genesis in our company. You can actually get a website set up from a hundred and ninety-nine dollars, so I know that budget-wise that’s going to suit pretty much everyone. The next level up, the $299 websites, are responsive, which means they work really well in mobile phones and portable devices. You can put a single page for your single product and start off there. This is what you call the minimum viable product. So for $299 you have the mobile responsive website that can handle most different devices, and you can put a product on there to sell. Once you make more sales and you want to grow it, then you can look at something like a WooCommerce add-on, where you can start adding products in an ecommerce style on your WordPress website. It’s easy for developers to work on, it works really, really well for search engines, it’s fantastic software. It’s what SuperFastBusiness is built on. So that’s my solution for your scenario. Good luck with your marketing efforts, Tony. Listener: Hi, this is Eric. I’m just wondering how to build a continuity business on a very limited budget. I don’t have a lot of money to spend, I’m just trying to figure out how to make more money so I can expand the business. James: Hey Eric, I know what it’s like starting out with a new venture, and I’m doing a few thought around this how to start a continuity business without much money. You’ll need an offer. The offer will have to be valuable to your target audience, so the classic adage is “Solve a problem”. If you can help someone solve their problem then that will help you as well, and they’ll probably pay you for that, so what you need to do is find a solution that’s valuable to someone. Now it could be as simple as a service. I was having a conversation with a friend of mine yesterday, and he was also I guess lamenting that it’s hard to set up a business online and I said “All you need is one sales page on your website with an offer that people resonate with and are happy to pay you for.” And he did that. He put up a sales page. It was just a text page describing how he could help a business owner, and then it has a payment option, and then the goal is to drive traffic to that. Now this payment can be a recurring subscription, and just to echo what we were talking about earlier in the episode, you don’t have to have a forum. You don’t have to have a high-intensity deliverable. In fact, if the membership simply provides more value than what people pay, it could be anything. It could be a phone service, it could be an accounting service, it could be you sending them a magazine each month. It doesn’t really matter the deliverable format. It matters how you can create more value than the investment you’re asking for. So, if you’re on a budget, go and get yourself a domain name for nine dollars, set up a landing page for that domain, which you can get from most hosting companies for probably six dollars a month. Or if you want to go fancy, set up something like LeadPages, which I recommend from my friend Clay Collins, and put some high-converting sales copy and a payment button with a recurring subscription. That’s the minimum you need to get started if you want to take the online approach. So I hope that helps you, I’ll be interested to see if you implement this, perhaps come back and leave a message, and we’ll see how you went. Thank you. Listener: Hey James, Taki Moore here. Dude, I’m in New Zealand right now, just wanted to say you’re a legend, and wanted to leave you this little SpeakPipe message. Hope this finds you well, I’ll talk to you later. James: Hey Taki, great to hear from you. Now listeners, Taki Moore is a very smart man. In fact, he’s someone I put time aside to go and have a burger with on a Friday here in Sydney. And I do that because he’s really good with systems and templates. I hope to interview Taki on a later episode, and you’ll get to find out what I’m talking about here. Have a great time in New Zealand, Taki. Listener: Hi, thanks for the videos, Steven here. I completely agree with you about the Facebook comments. I get so many on my PaleoBar page. I’m a hundred and thirty-two kilos now. I’ve lost eight kilos on my paleo diet over the past six months and I’m now selling the bars, and people just don’t get the journey I’ve been through, and everyone’s saying, oh, you know, you’re overweight, blah blah blah, but, you know, at the end of the day I’ve got a good business, I’ve got a good product, and it’s truly worked for me and it’s just people hating on it, and it’s obviously unfit, overweight people. It doesn’t even bring me down anymore, it just makes me feel sad for people. Anyway, thanks for the video update. James: Hey Steven, I really appreciate that comment. It’s from the heart and I posted that video about people hating on Facebook because it does actually get to you a little bit sometimes when you think, gosh, if people only knew the amount of effort involved in putting out free podcasts and free videos continually, and then for, you know, these people just don’t understand how Facebook works and who actually pays for it. And the fact that the advertisements on there are targeted and are relevant, and most of the people hating on it are somehow probably a friend of a friend or of even someone who might have even liked the page, so it’s good to know that there’s other people out there who’ve been through the same thing, and I’m also encouraged that you don’t let it get to you, and keep putting out the good stuff, and good luck with your weight loss. Perhaps come back and give us a post, tell us when you hit the below the 100 mark or something inspirational and I’m sure we’ll go and check out your page and probably buy those bars. Thanks, Steven. Listener: Hi, this is Vondell, James, we spoke briefly yesterday, and I’m trying to fully understand because I’m so used to seeing affiliate links and programs that I’m trying to understand how you differ or how you are alike. So I understand that it’s probably not a commission that I would make but once I order the business services site am I to understand that it’s $299 to get a site built and then I would market and promote my own business services site with your products and programs and services for some type of profit? What’s the profit on that, and what’s the markup that I’m allowed? Loving every minute of this James. I hope you keep this up as love the format. :) I see you have taken your voice messaging down. I put one on my site and it is amusing the message I have gotten so far. Anyway, affiliate pounce model brought me in almost $3000 last week. I learnt the model some time ago, but seeing it on your site reminded me of it and put it to action. I was doing review sites and seo before that, the problem was I wasn’t building a list. Now I’m building a list of buyers using the affiliate bonus model. Also, I am doing a service business. Anyway, just thought I’d let you know a bit about me and that I am learning a lot from you. Once I get a high paying client I will come to you for the reseller. There are other resellers out there, but I think you deliver the goods. Chris the voice option is still there – it is in the footer on the bottom left to be less distracting. (I mention this in the audio), It still works great. Any thoughts on Premise for memberships? It integrates with vBulletin if you want to add forum functionality.